In Delegate365 version 6.2 update we added an important feature to save Delegate365 licenses. 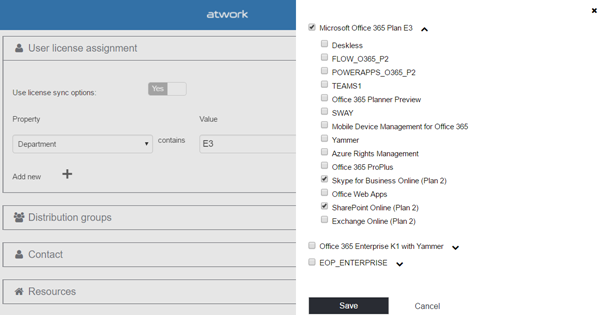 With this Delegate365 version, there comes a new, powerful feature for more Office 365 automation. The new version number is 6.4. No worries, you have not missed version 6.3, since this was an internal version for adding the new user license assignment feature, testing and fixes. Delegate365 version 6.4 will be rolled out in the next two weeks. So, what does this update do? Why additional license assignments: In Delegate365, all manageable objects as users and groups are assigned to an Organizational Unit (OU). This can be combined with automatic license assignments which is available since about two years (see the basic functionality here). Recently, we got requests to add additional features for automatic Office 365 license assignments from some of our customers. Most of the Delegate365 customers are adding the desired OU name to a specific user attribute to ensure that new users or user changes are automatically assigned to the corresponding OU in Delegate365 through the SyncOp. As mentioned above, this can be combined with assigning an additional Office 365 license coming with the OU assignment which is a very common scenario. Sometimes, additional Office 365 licenses shall be added automatically. Now there comes an additional feature in the Sync options to add Office 365 licenses to users based on custom values as follows. 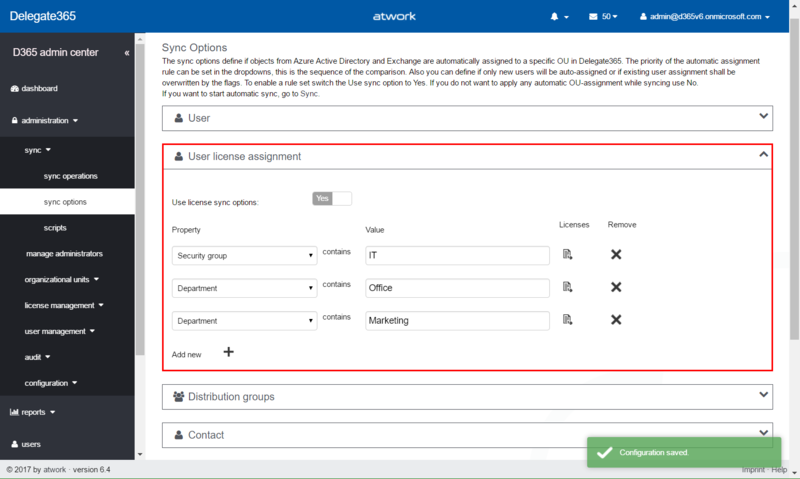 How to set additional license assignments automatically: In administration / sync / sync options there’s a new region named User license assignment. This works as the other available options and can be set to Yes or No with the Use license sync options switch. Below that, multiple conditions can be added as follows. By default, the Use license sync options are set to No. If “Department” contains the value “E3”, then assign specific plans of the E3 license (or similar). As first step, the user property selection is made and the string to compare is added (here: “E3”). Then, a click on the Licenses icon opens the license panel on the right. Here, a custom set of licenses can be selected. in this sample, the user shall get “Skype” and “SharePoint” plans, if the condition is met. The license set must be stored by clicking “Save”. Now the condition (that line) is defined. Click the Save button at the bottom to save all Sync options on that page. The configuration is persisted and will be used by the following Sync operations. Matching rules: The Sync options can be used for comparing user properties (as Department, CustomAttributes, etc.) or if the user is member of a security group as well – same as the user sync options for assigning to an OU. The value must be part of the selected property (upper and lowercase and spaces at the start or end are ignored) so the condition always says “contains”. So in this example, the condition works and will be executed, if the user property in department is set to “E1, E3, E5”, or “set license to e3 and e5” or simply “e3”. 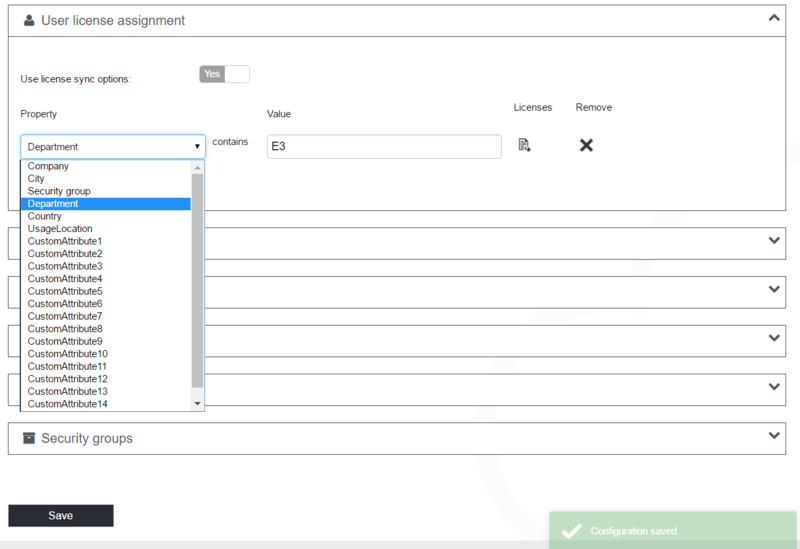 With that mechanism, administrators can create powerful automations for assigning any license set, defined by any custom value. License selection: The Licenses icon visualizes if there are licenses selected or not. This helps to see at a glance if licenses will be added or not. Remove a license condition: To remove a condition, click the Remove icon “x”. There is no confirmation needed. Th enew configuration is saved by clicking the Save button at the bottom of the page and is valid immediately for the next SyncOps. All sync options are used when the next sync operation runs (automatically or manually). This means, you will see a result – the users matching the defined condition will receive the Office 365 licenses - after the next SyncOp. Additional licenses: To keep in mind: As in all automatic license assignments in Delegate365, Office 365 licenses are always added additionally. So, licenses are never removed from a user with any automatic task. To make it short: The new User license assignment options help to automatically add Office 365 licenses independently of OU-assignments in Delegate365. This only affects users that are assigned to an OU in Delegate365 – to users that are visible in Delegate365. Manage administrators fix: If the display name of an administrator contained round brackets (as “John Doe (Scope administrator)”), the text within the brackets was not saved. This has been fixed. Login process fix: In some rare cases and specific tenant configurations, an error could occur after the login process denying access to Delegate365. We identified that issue which seemed to be a misconfiguration of the Microsoft AAD login methods and workarounded that scenario. So the login process will now react to that situation and deliver a meaningful error message that there’s a false identity used for that Office 365 tenant. Delegate365 version 6.4 allows to automate custom license requirements. This is a powerful addition for auto license assignments within Delegate365. Now Office 365 licenses can be set by simply adding a user property to any custom value and by defining one or more conditions in the Sync options. The deployment of the update will start by May 8th and during the following two weeks. Enjoy automating with the new new user license assignment feature!